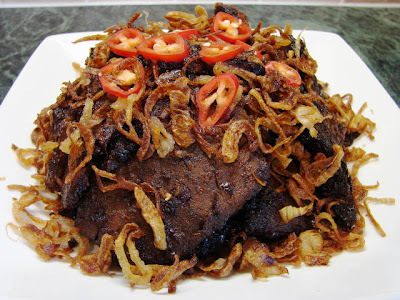 Daging dendeng is Malay spicy dried beef like jerky. It's rather yummy, savoury, spicy, sweet and sour. I had this with rice and cold beer it was very good. To make this will take a bit of time but it is not that difficult. Brown the meat with a little oil till golden all over. Put the meat in a stock pot, put all the ingredients in and pour enough water to cover the meat. Simmer at medium heat for about 15 - 20 minutes till water is hot, skimmed off any scum. Then turn the heat right down to minimum cover and simmer for another 80 - 90 minutes. Take the meat out, lightly cover and let it cool. Once the meat is completely cooled, cut into slices about 0.5 - 0.6cm thick. Then pound the meat (not too hard) with meat hammer or rolling pin till the meat fibres are loosen but not falling apart. You can prepare this in advance and keep the prepared meat in fridge up to 2 days. Discard the spices. The boiling liquid is excellent for soup noodles, to add extra flavour maybe throw in a few bones or another small piece of beef at the beginning, makes excellent Vietnamese pho. Slice the shallot very thin deep fried in hot oil till golden and crispy, you do need to stir regularly to prevent the onion browning quicker around the side of the pan. Drain on paper. Reserve the oil for later use. De-stalk and de-seed the dried chillies then soak in hot water till softened. Drain. Soak tamarind with boiling water and leave till cooled, then squeeze with hand to release the pulp then sieve. Remove fibrous outer layer of lemongrass, top and tail, then thinly sliced into rings. Blend chillies, shallot, garlic and lemongrass in a mini blender till very smooth. If the machine is struggling add a tbsp or two of the tamarind juice will help. Fry the meat with few tbsp of shallot oil till browned both sides. You may need to do this in several batches. Remove meat. In the same wok or pan add about 6 tbsp of the shallot oil and fry the spice paste and star anise for about 10 minutes then add in palm sugar, ketchup manis, salt, tamarind juice and salt. Continue stirring for another 5 - 10 minutes till the mixture is drier and thicker. Add in the meat pieces and stir fry till all the sauce is absorbed and the meat is very dry, about 10 - 15 minutes. Stir in a handful of crispy shallots.